A sacred well in the mosque of Mecca; identified by Islamitic legend with the spring from which Hagar and Ishmael drank (Gen. xvi. 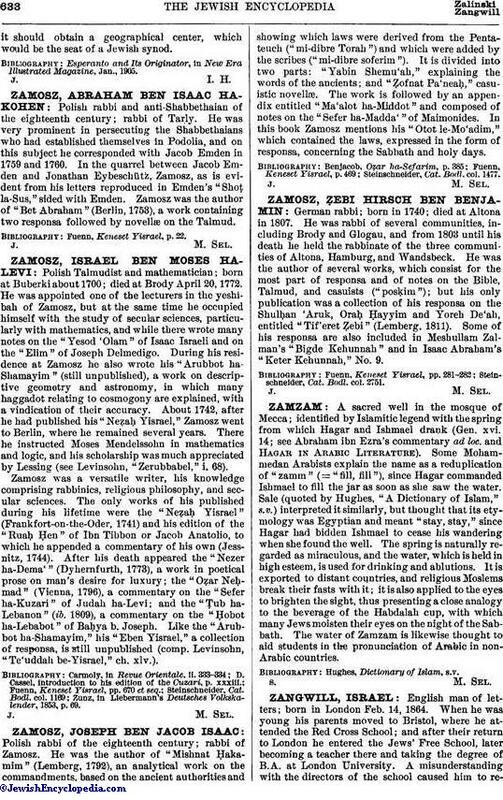 14; see Abraham ibn Ezra's commentary ad loc. and Hagar in Arabic Literature). Some Mohammedan Arabists explain the name as a reduplication of "zamm" (= "fill, fill"), since Hagar commanded Ishmael to fill the jar as soon as she saw the water. Sale (quoted by Hughes, "A Dictionary of Islam," s.v.) interpreted it similarly, but thought that its etymology was Egyptian and meant "stay, stay," since Hagar had bidden Ishmael to cease his wandering when she found the well. The spring is naturally regarded as miraculous, and the water, which is held in high esteem, is used for drinking and ablutions. It is exported to distant countries, and religious Moslems break their fasts with it; it is also applied to the eyes to brighten the sight, thus presenting a close analogy to the beverage of the Habdalah cup, with which many Jews moisten their eyes on the night of the Sabbath. The water of Zamzam is likewise thought to aid students in the pronunciation of Arabic in non-Arabic countries. Hughes, Dictionary of Islam, s.v.